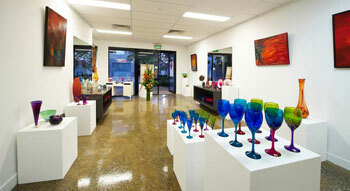 Tonight is the opening of a brand new contemporary art gallery in James street called C Gallery. They have taken on HolyGreenCow as one of the 2D artists in the gallery. The gallery is predominantly a Glass / Ceramics and Sculpture space. It was a great opportunity to be taken on by Troy at the gallery and I wish him every success. Here’s what I guess you could call a trailer for my new series, which was going to be called ‘austrALIENation’… but that title has already been used unfortunately for another exceedingly great photo series by John Ogden. Nevermind. I will just have to think of something else. There’s a few surprises coming up in this series and I’m looking forward to working with old and new friends to get my message across. Anyway, it was an awesome day and Holy Green Cow has been given a great honour, by having all four works from the ‘They Came‘ series acquired (purchased) by the Toowoomba Regional Art Gallery. Not only that, but they have been chosen for the ‘Crates on Wheels‘ touring exhibition in 2011 !!!! I had a great chat with the Lord mayor and his wife about Holy Green Cow and art and music. Special thanks to Sue and everyone at the Gallery. It was a fantastic exhibition and I am really quite blown away. Following some sage advice from the director of the QCP (Maurice Ortega) a decision was made to revamp the Cataclysm series into a new format which sees it as more of a collection of political commentaries on Australian society. Thankfully the change has brought immediate rewards, with a number of images being selected to appear in the Pine Rivers Regional Art Gallery this December. As part of the SNAP! photographic exhibition being held there December 3 – 24. It should be a fantastic exhibition and a great chance to debut these new images. Check out the new stuff here. Cataclysm will be added to on a monthly basis, or whenever I feel the need to say something. At this stage, only the three new images are up there so check back every now and again to see what’s new. Get on down to the QCP too (cnr Cordelia and Russell sts South Brisbane) and support the best local talent in photographic art!!! HolyGreenCow has just been asked to exhibit in the Pine Rivers Regional Art Gallery in December as part of the ‘SNAP!’ Photographic Art Exhibition for the Moreton Bay Regional Council. This will be images from the newly revamped ‘Cataclysm 2.0’ series.